Filled another stall in my 1911 barn! Thread: Filled another stall in my 1911 barn! I have been waiting for two guns I ordered, a 1911 and a Draco. 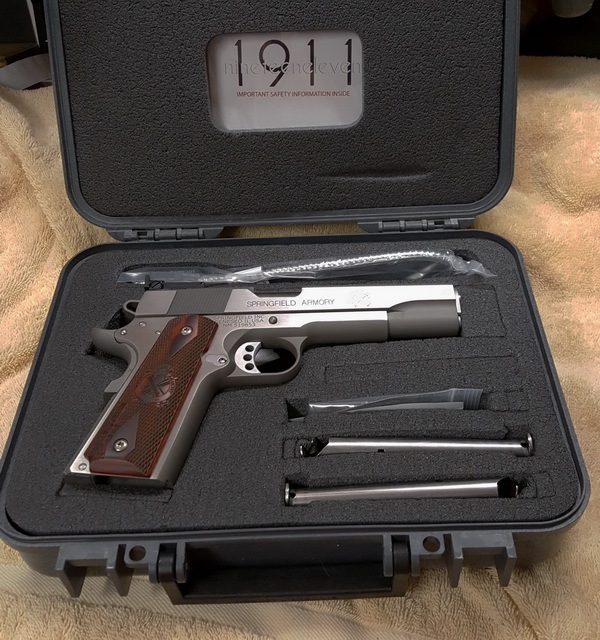 I'm still waiting on the Draco but I did get the new 1911. 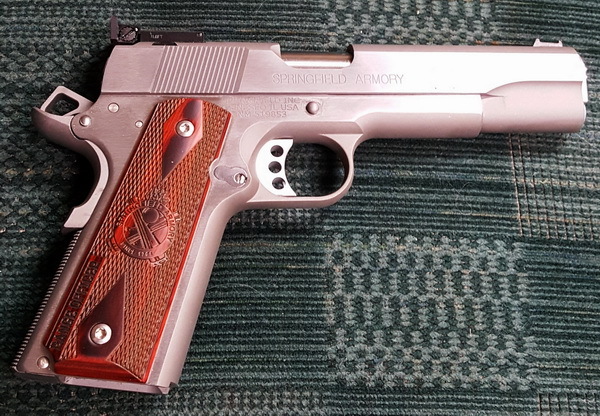 It is a Springfield Stainless Range Officer Target 1911 in .45 acp. 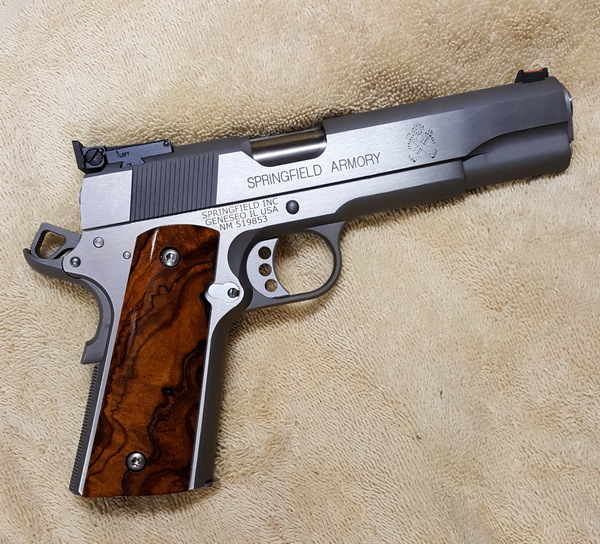 I have not bought a new Springfield anything in some time and my first impression of this one is all positive. Believe it or not, one of the biggest "I didn't expect that" things is the box it came in. 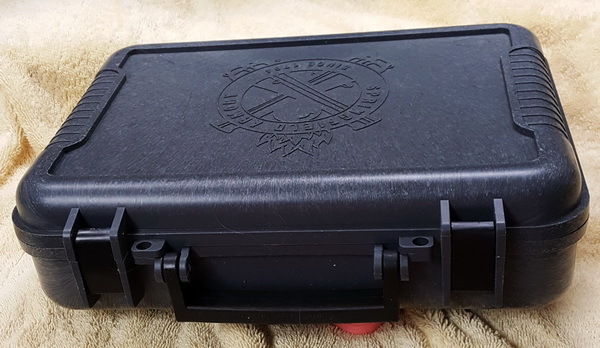 Instead of a thin plastic box with cheap latches Springfield shipped this 1911 in a very nice Pelican style box. It is hard plastic with real compression latches and an "O" ring seal in the lid. It has strengthening ridges on all for sides and the Springfield logo seems to be laser etched in the top. Inside the box are all the usual paperwork, two stainless 8 round magazines. a gun lock, a three inch piece of red fiber optic tube and another three inch piece of green fiber optic tube so you can easily change the front sight (it comes in red) or simply replace it if it gets broken. There is also an allen wrench, a lube sample (Lucas extreme duty gun oil), a cleaning brush, a chamber flag, and of course, the gun. The gun appears very well made and I can find nothing wrong with fit or finish. 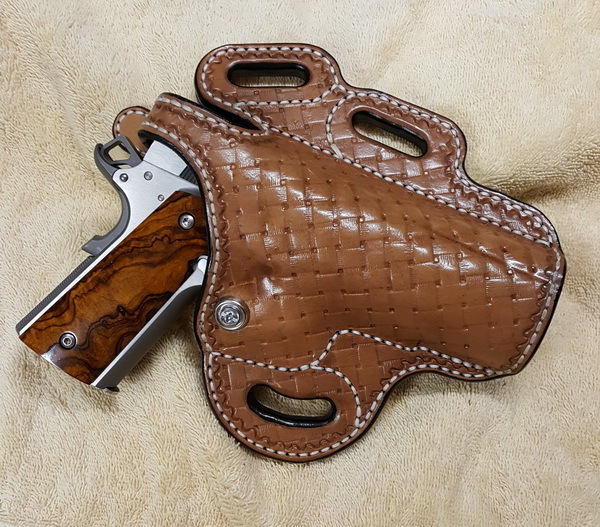 The SA grips are nice (they are Rosewood with the SA logo and range officer laser cut into the wood) but as with all my 1911's I prefer a smooth grip so I have already replaced the factory grips with a set of customs carved out of Desert Ironwood for me by Curt Ullery. I will try to put together a full range report after I shoot the gun later this week. This image has been resized. Click this bar to view the full image. The original image is sized 600x640. I collect Rimfire Firearms (.17 HMR, 5 mm Magnum, 5 mm Craig , 6 mm Flobert, .22 LR, and .22 Magnum), especially Mossberg's. I look for old, different, unique, or rare rifles and handguns in any rimfire caliber as well as parts. If you have anything in this category you want to sell or trade please e-mail me at fatboyflorida@gmail.com or PM me here on the forum. OMG!!!!! That is gorgeous and look at the match with that holster!!!! I am jealous !!!! Very nice. And I like the grips. Looking forward to your range report.